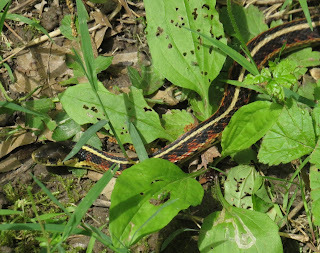 Large patches of touch-me-nots (aka "jewelweed") carpeted the edges of the lawn where it gave way to forest, and the leaves of this plant offered places to bask for many insects. The first fly I spotted was one of my favorites in the family Syrphidae (flower flies). 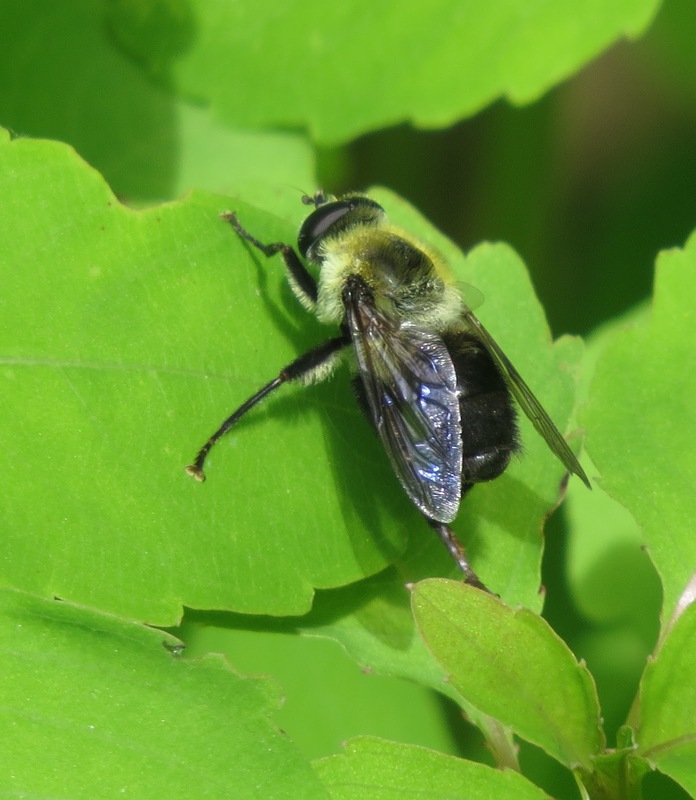 Somula decora is roughly the size of a honey bee, black in color but heavily marked with golden yellow. 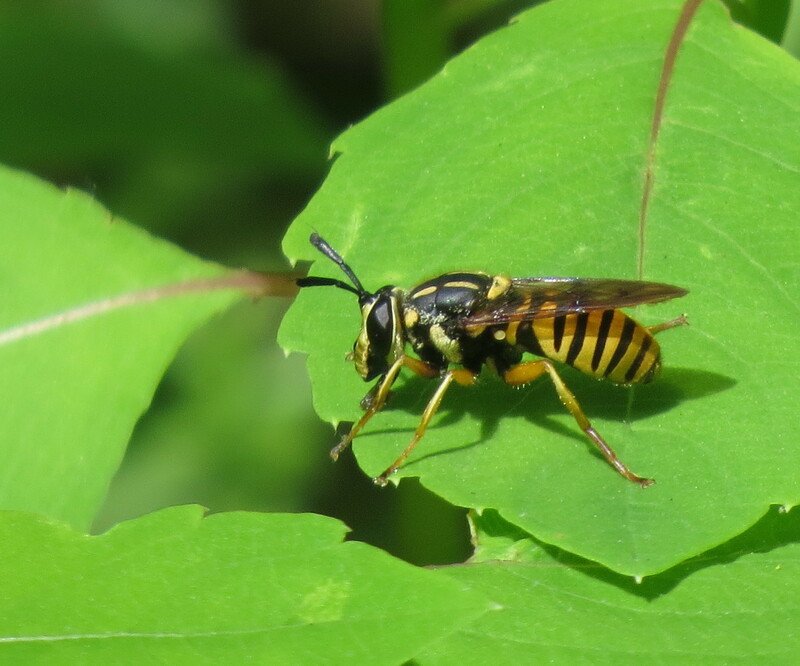 I suspected that this species is a mimic of scoliid wasps, but at this time of year a more likely candidate for a model would be a queen yellowjacket. Helophilus spp. are also probably yellowjacket mimics. The vertical yellow stripes on the thorax help to identify them fairly easily. Apparently the larvae develop in decaying plant matter that is submerged in water, as do other Syrphidae species like the "rat-tailed maggots." The adults certainly are sun-loving as their genus name suggests. 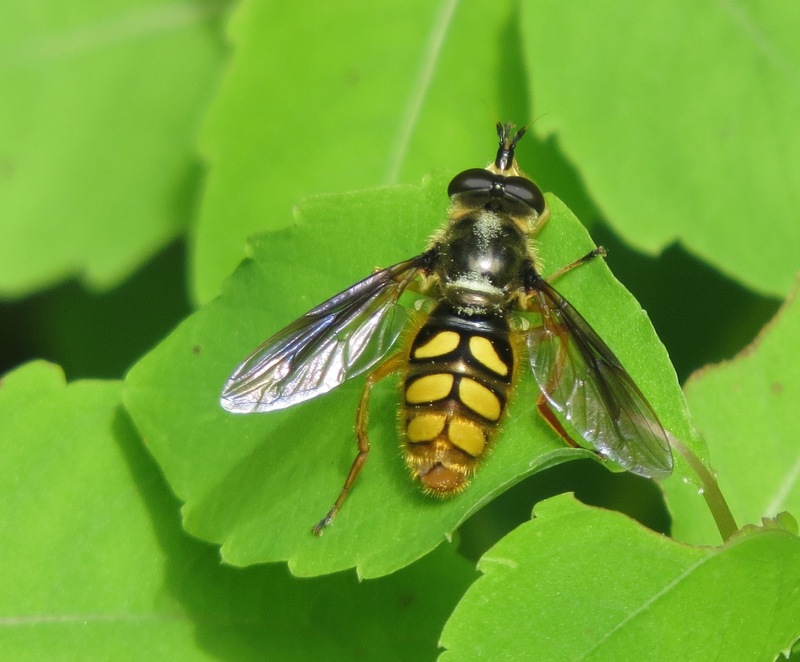 Syrphid flies in the genus Temnostoma are likely mimics of the solitary mason wasps that are in the same family as the social yellowjackets. They carry their mimicry to astonishing extremes. 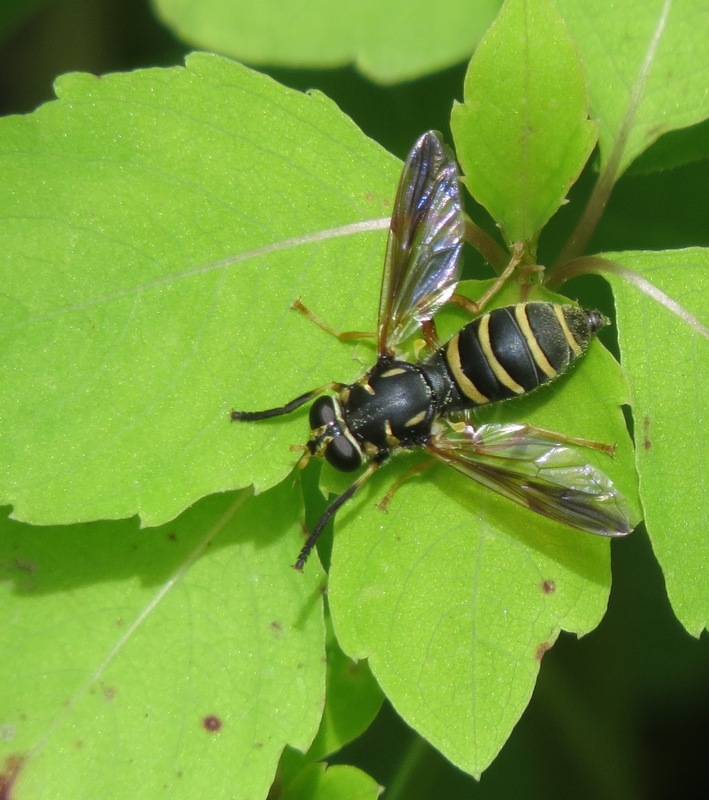 Note that the leading edge of their wings is darkened, mimicking the longitudinal folds of a vespid wasp's wings at rest. 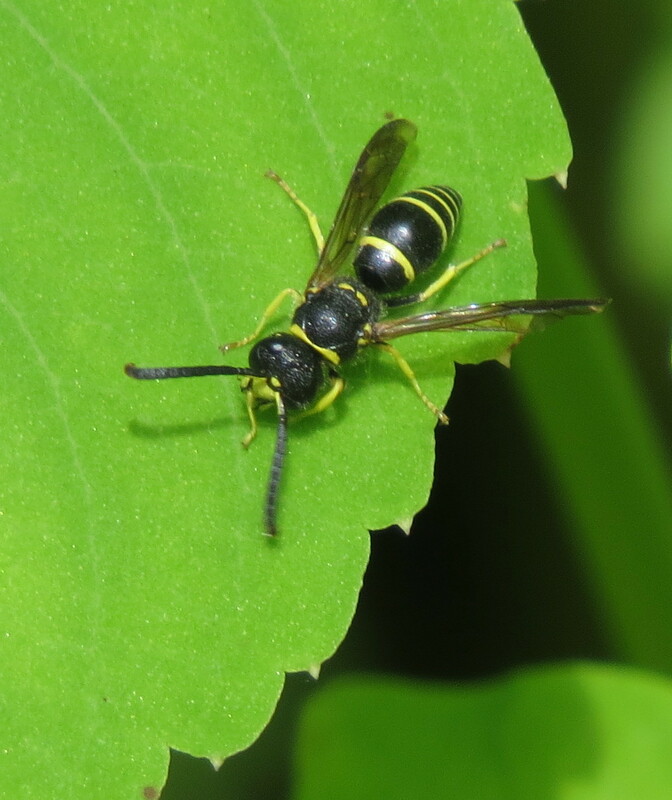 Wasps have long, reasonably thick antennae, which Temnostoma flies don't have. No worries, the fly compensates by waving its front pair of legs in front of its face, just like wasp antennae. Wh-a-a-a-a-t?! I know! Next time I'll take video. Well, lookie lookie, here comes an honest-to-goodness, certifiable mason wasp. 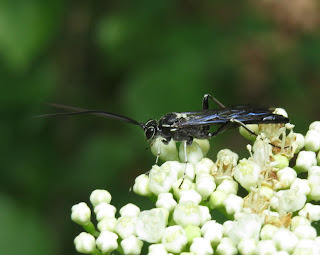 This is a male, as the tip of each antenna is hooked, a distinguishing characteristic for many male eumenine wasps. I am a little hard-pressed for a genus, but I suspect it might be Ancistrocerus. Female mason wasps usually nest in pre-existing cavities like old beetle borings in logs, hollow twigs, etc. 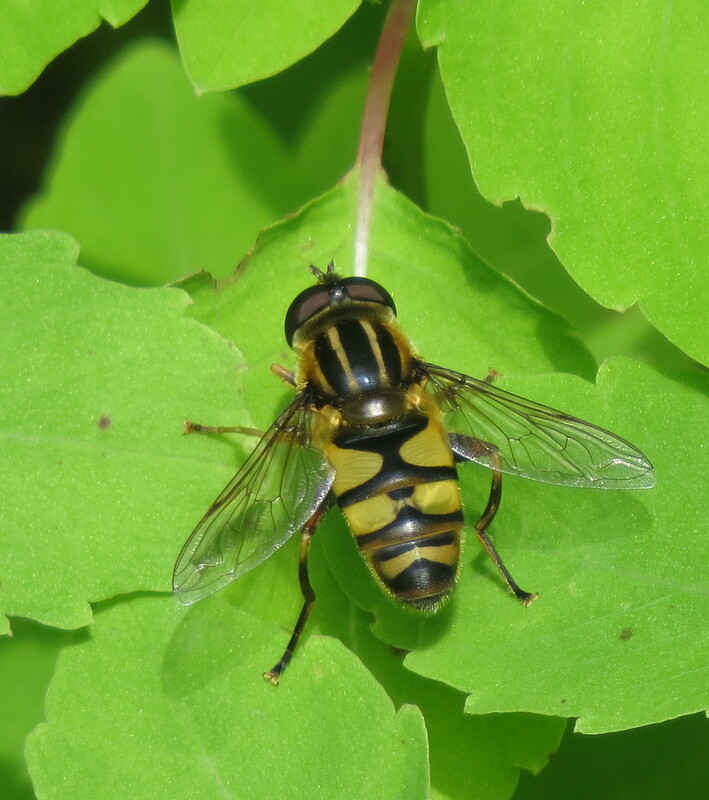 Yet another kind of syrphid fly we saw was this Chalcosyrphus species. They are typically assumed to be mimics of solitary wasps in the families Pompilidae, Crabronidae, or Sphecidae. Indeed, some species even flick their wings like wasps while they run around on foliage or the surface of logs. Their larvae live in decaying wood, but at least a few may feed on fermenting sap. 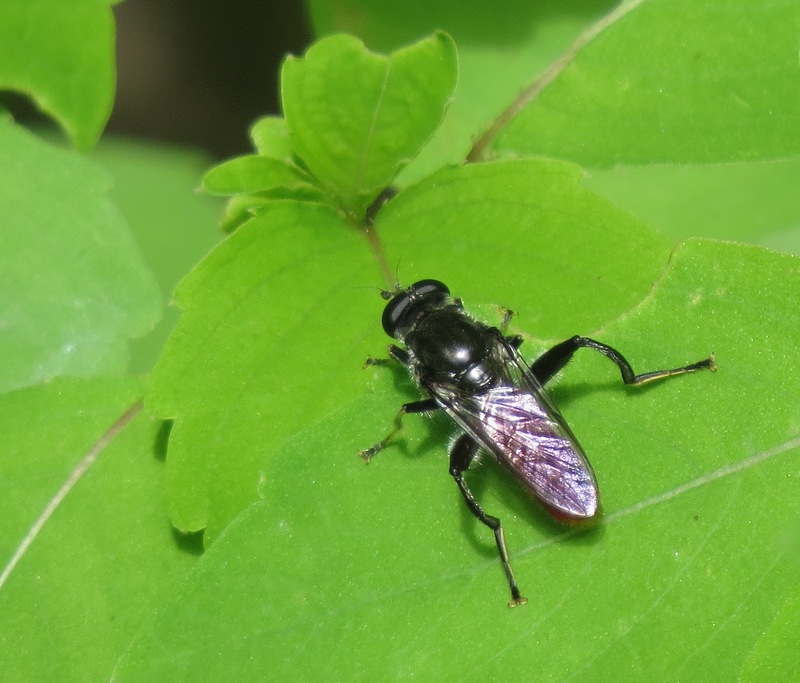 This species has a red abdomen, but others are wholly black or otherwise colored differently. There are 22 species in North America, so identification is difficult without putting a specimen under a microscope. Closely allied to Chalcosyrphus is the genus Xylota. Oddly, this specimen reminded me most of a sawfly or an ichneumon wasp, neither of which is usually capable of stinging in self-defense. The adult flies rarely visit flowers, instead feeding on pollen grains from the surface of leaves. The larvae develop in rotting wood. 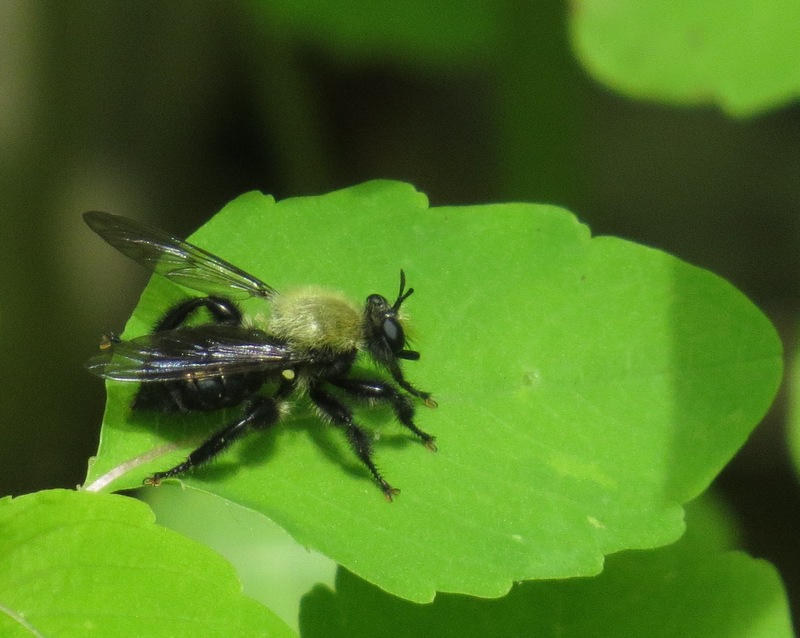 Many syrphid flies use leaves as a platform on which to groom, which explains the yoga-like moves of this specimen of Mallota posticata, a bumble bee mimic. I swear, grooming flies must be the envy of contortionists. As larvae, these flies grow up in rotting holes in trees. Eastern Yellowjacket queen, a real wasp! 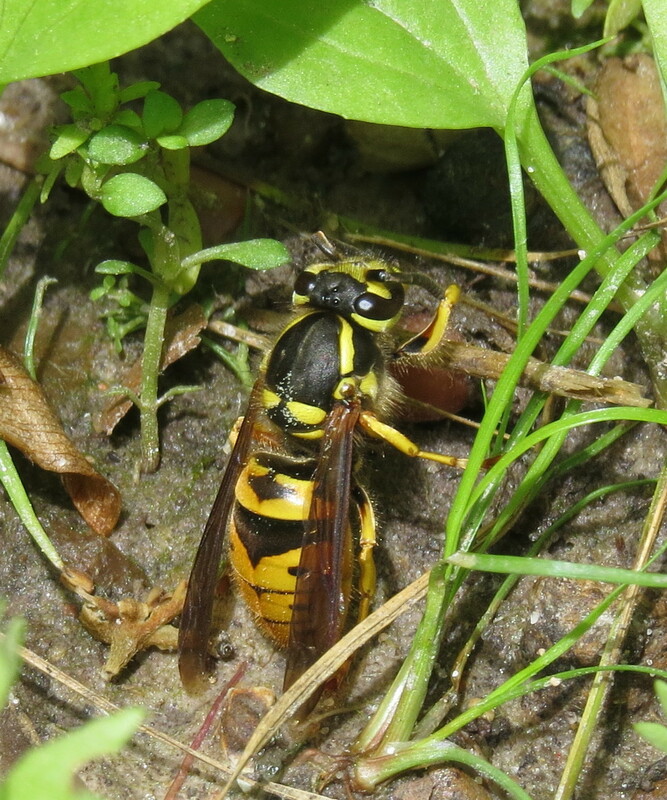 My, my, here we have another actual wasp, a queen of the Eastern Yellowjacket, Vespula maculifrons, pausing from her search for an underground nesting site. She is likewise grooming. 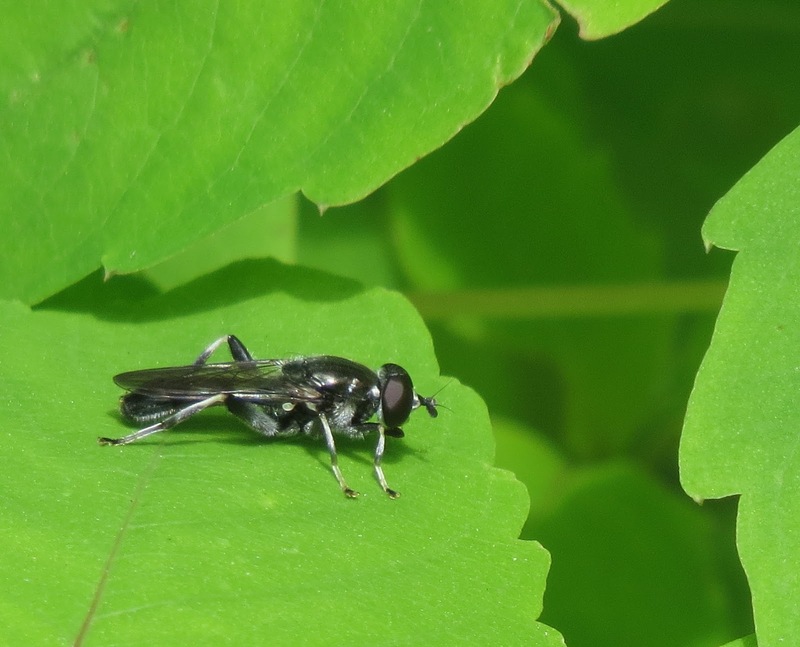 This particular species is very likely the "model" for most of the "mimic" flies we were seeing....and arguably the best mimic was yet to come. The syrphid fly Sphecomyia vittata is simply stunning. It is about the same size as a queen yellowjacket, and even has longer, thicker antennae than almost any other fly, the better to resemble its sting-equipped model. This insect even flies like a queen yellowjacket, in the lazy, zig-zag manner of a queen looking for a nesting site. I recall capturing one of these in Cincinnati and being convinced it was a wasp right up until I had it in the jar. I was jaw-droppingly impressed. 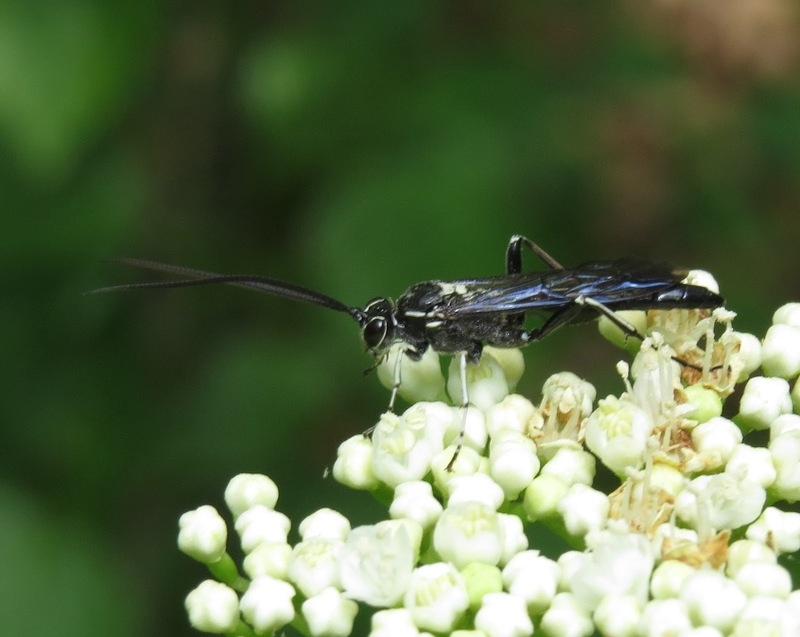 Ah, here is an ichneumon wasp that looks suspiciously like that Xylota flower fly we saw a few minutes ago. At least some members of the subfamily Ichneumoninae can sting, so maybe looking like one is a better strategy than first imagined. Somewhere along the line my wife spotted this fly, which I never saw. It is obviously a bumble bee mimic, but it is not a syrphid. It is a robber fly in the family Asilidae, genus Laphria. Looking like a bumble bee works to its advantage in two ways: its potential predators assume it stings. Meanwhile the fly's potential prey assume it is a bee seeking flower nectar. Interestingly, Laphria seem to be particularly fond of small, flying beetles, which they spot from their perches, apprehend in mid-air, and return to a leaf or log to feed upon. What a rewarding rest stop. 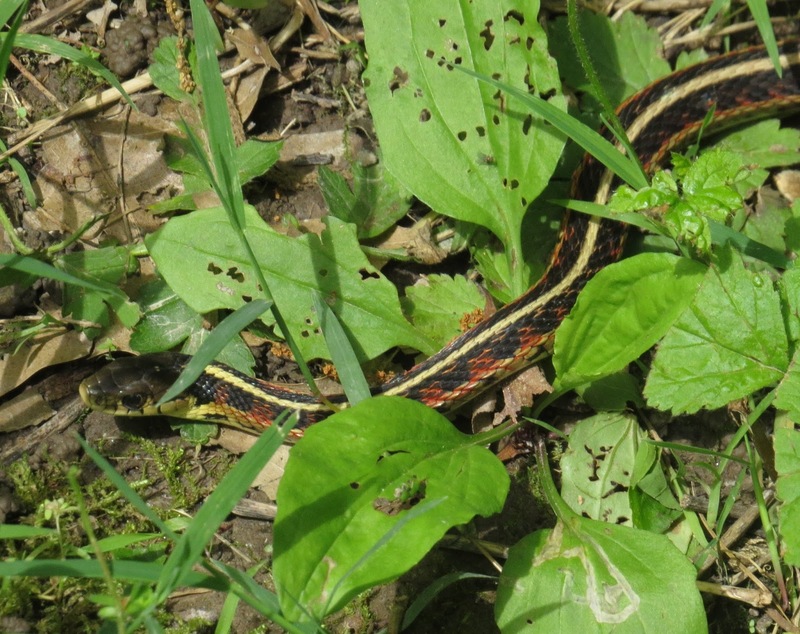 Oh, and there was this bonus Common Gartersnake, Thamnophis sirtalis, also soaking up some rays. It never moved an inch as we worked around it to take insect images. Thanks to the maintenance crews at this rest stop for recognizing the importance of leaving natural elements intact around the area, including dead wood for insects to feed on, and birds to nest in. May other states follow your example. Source: Marshall, Stephen A. 2006. Insects: Their Natural History and Diversity. Richmond Hill, Ontario: Firefly Books, Ltd.732 pp.